I love politics. Even when I’m getting knocked down with the drama and challenge that comes with a political game, I still love to play. There is a little bit of politics in everything and for me it’s the ultimate show. Human nature plays a big role in politics. At least it does from my perspective. Good or bad, right or wrong, yes or no; the decision will come down to a person’s integrity. And my vote will always come down to how I perceive it. The clincher is when I find “intent with integrity” and that is what I heard and felt listening to Humza Yousaf at SFU last week. I had attended a private event the night before and had the opportunity to speak with him one-on-one… my overlying thought was, I want to vote for this man. I want to follow his path. I like him. And how come we don’t have these types of politicians in Vancouver today? Humza is a member of the Scottish Government. Google him, you will be amazed. But back to Humza. He’s young, and intense and clearly making the most of what he does best. His plate is full with the mission to make Scotland a better place. 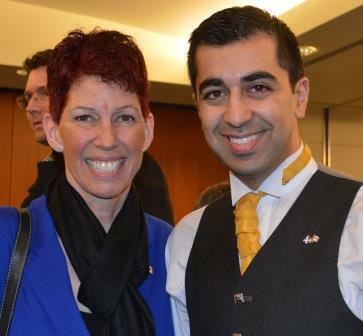 He was here in Vancouver to attract business to Scotland as well as preach the “yes” vote in the upcoming referendum. That first meeting, Humza leaned in and listened as I shared my story of how his government helped locate my birth-family history in Scotland. I saw empathy and a touch of pride in his eyes. But most of all, I saw a man caring about another person’s life. Yes Lin… and you would have loved to meet him.